As the old song goes, "Oh, I do like to be beside the seaside", I also like fish and chips, so sometimes we pretend to be on holiday and treat ourselves to fish and chips by the sea. It's naughty but nice, just like those old-fashioned saucy seaside postcards. Our favourite spots in the Redlands for fish and chips while gazing over the water are, Cleveland Point and Wellington Point. If you like your dining to be more refined than fish and chips then The Lighthouse Restaurant has plenty of seats, inside and out. The view from Cleveland Point, The Lighthouse Restaurant to the right. The atmosphere is good and there's lots of variety on the menu, (available as a PDF from their website.) Attached to the restaurant is a cafe for light meals, coffee and cake, and a take-away section. The take-away fish and chips is what we usually go for, and we're happy to sit and eat under a shady tree, or at a table and benches if we are lucky enough to find one unoccupied. If you're on a really tight budget, just get chips, take your own bread, butter and tomato sauce and have chip butties instead. We did that many times when we had small humans with us. Add some drinks and fruit and you have an instant picnic. It's a pebble beach and mangroves, so you'll get no sand in your sandwiches which is a bonus, and there is lots of grass to kick a ball around. There's also a fancy toilet block where you have to lean against the sink to make the water flow. No hands. There was no sign telling me this, it took me a minute to figure out how it worked, so consider this a public service announcement. 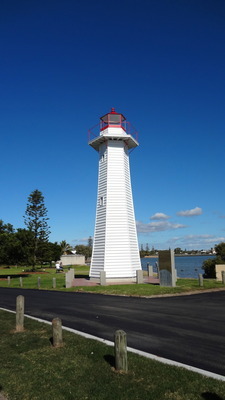 Wellington Point is another destination for sea-gazing. Here you can dine in at the Point Of View Restaurant & Cafe, or purchase from the Take Away Kiosk. If you have children with you, there's a playground area shaded by huge Moreton Bay Fig trees, where you'll see children all over the trees as well as the playground equipment. Or you can stroll across the coarse red sand to King Island if you time your visit to coincide with low-tide. So, next time you want to break the work and sleep cycle, run away to the seaside and treat yourself to some fish and chips and contemplate the universe while gazing at the ocean. If your digestion cannot cope, or the guilt at all those calories is too much for you, then at least have a coffee or an ice block. It'll do you good. Why? To break the work/sleep cycle you sometimes have to treat yourself on the weekends. Where: Wellington Point and Cleveland Point.